I recently made a cheesecake for a B-themed party for my friend Bingham. 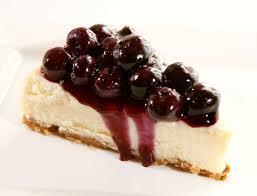 Guests brought burgundy, beer, green beans, salad with bleu cheese; I made cheesecake with blueberry topping, rather like the picture. Naturally, for these august occasions, one doesn’t want the dreaded Cheesecake Crack on top, exposing oneself to ridicule and shame on the part of partying foodies. The solution, intones the supremely confident Best Recipes by Cook’s Magazine, is to nest the spring form pan in a turkey roaster (of course), and carefully pour boiling water around the pan. Bake until jello-stage, then let sit in the oven for an hour with the door propped open by means of a long-handled wooden spoon. You may be sure that Cook’s tested many spoon options. Has to be wooden. And the cake was indeed, as promised, rich and creamy, artfully slivered for the populace by my friend and fine cook, Jim Harb. But does Cook’s know how ancient the cheesecake ethos is? It’s very old. It’s very international. Which figures, cheese not having just fallen off the turnip truck itself. And thus follow some cheesecake and cream cheese thoughts. Cato the Elder’s De Agri Cultura includes a recipe for “placenta,” which is not what you’re thinking but a crusted cheesecake. The cheese of cheesecake varies by country: quark in Germany, cottage cheese in Sweden, ricotta in Italy (a blog to come on that romantic story-of-culinary origin). In Bulgaria there may be ground nuts in the crust. In Belgium, the cheesecake is elevated to celestial joy with bittersweet chocolate. If you ever wonder where you are in Europe, ask to taste a cheesecake. The cheese we know as Philadelphia cream cheese was failed but fortuitous 1872 imitation of the French Neuchâtel by one William Lawrence of Chester, NY. Then Kraft came along in 1912, pasteurized Lawrence’s creation and thus we have Philadelphia cream cheese. When I was living in Italy there were TV commercials for cream cheese, commonly called “Filadelphia,” in which a family is hosting an attractive young Korean girl, evidently an exchange student. In the early seconds of the spot, she’s lonely and feeling far from home (which she is). Then she is shown how to make cunning appetizers with Filadelphia cream cheese and instantly becomes a happy girl, nesting into middle class Italian life. So if you’re ever feeling displaced, far from home, eat some cream cheese or make a cheesecake. And you may feel better.